There’s no denying trouble finds Rose Gardner like a divining rod finds water, especially when Rose lands in the middle of a bank robbery. But after the robbers steal her deposit bag—containing a large amount of cash—she soon finds out that trouble is threatening her business as well, thanks to her sister Violet’s financial mismanagement. To top it off, Rose’s ex-boyfriend, Joe Simmons, has moved back to Henryetta to fill the chief deputy sheriff position. Rose’s involvement as a witness is the perfect opportunity for Joe to reinsert himself into her life. But Mason Deveraux, Fenton County Assistant District Attorney and Rose’s new boyfriend, has waited too long for Rose to give her up without a fight. Rose’s pregnant best friend, Neely Kate, suggests they find the robbers using Rose’s visions and Neely Kate’s knowledge about everyone in town. 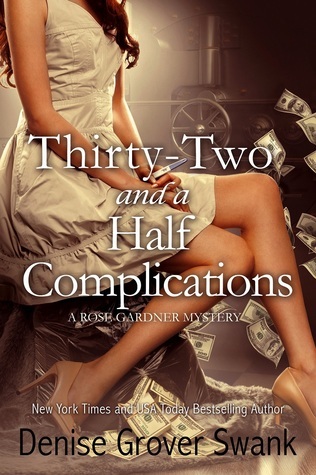 The women are soon hot on the trail of the stolen money, but Rose is caught off guard when Neely Kate’s snoopiness detects the biggest complication of all: Rose might be expecting a baby of her own. This is the 5th installment to the RGM series, and they just keep getting better and better. Rose is the type of character that deals with what life has dealt her, her life isn’t always easy, and trouble finds her no matter what she does (or doesn’t do). I fell in love with Rose in the very first book, and I know who I want her to end up with, but then again……as a reader, sometimes the one we choose isn’t the one the character chooses, although if I could talk to Rose, I’d be sure and tell her how I felt. Getting back to the book, Rose is in a pretty new relationship with Mason, he is strong and protective of Rose, and she doesn’t seem as shy as she once did. I love how Rose sticks close to those that most others would rather forget about, her interactions with everyone had me either laughing, or almost cowering away from my kindle. Rose has finally decided that yes, she can and will take care of things the way she sees fit, she has grown up so much from the first book that I can’t help but continue to cheer her on along the way. Now, with her “friendship” with Skeeter, that just might get even more interesting, and I for one can’t wait to see what happens next. If you are looking for a read that will have you laughing, feeling so stressed you want to pull out your hair, and actually saying “Crappy Doodles” out loud, this is the book for you. This book is part of a series, and past books lead up to the characters in this book and how they interact with each other, so be sure and start from the beginning, trust me, it’s worth the time it will take to read the other books before reading this one. Posted in Author Biography, Book Review, Links, Penned Con Author, Penny Pam, Synopsis. Bookmark the permalink.